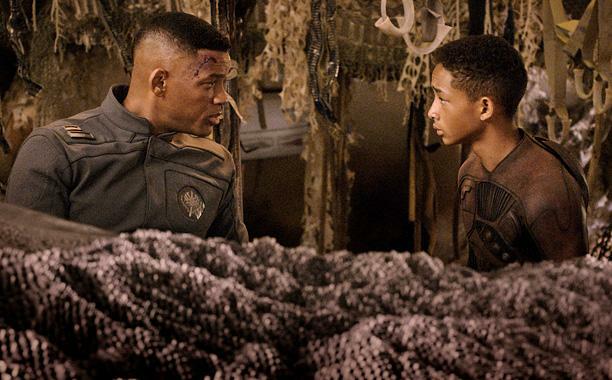 There's something seriously wrong with "After Earth." With such tremendous potential, one can only speculate how the film failed to capitalize. So many talented people, so many audiences crying out for it, and yet in the end, "After Earth" fails to deliver. Yes, I'm writing of course about the fact that Will Smith is in a film called "After Earth," and not once in the entire movie does he an encounter an extraterrestrial, punch it in the face, and quip, "WELCOME TO EARF! ", as he so eloquently does in "Independence Day." All kidding aside, whether it be woefully misguided critics, trivial percentages, or even outlandish claims of Scientology propaganda, the media really seem to have it out for director M. Night Shyamalan's latest sci-fi epic. Did we see the same movie? "After Earth" is easily the director's finest work since 2000's "Unbreakable," and a welcomed return to quality that proves once and for all that the director can, in fact, craft a solid, heartfelt summer thriller. In a distant future, Earth has become inhospitable to human life, thanks to a new race of alien life form trained to prey on humans by detecting their fear pheromones. Earth's populace is relocated to a new planet, and among its warriors is Cypher (Will Smith), a commanding officer who has mastered the art of "ghosting," or controlling his fear and remaining undetectable to the aliens. On this new world, Cypher's teenage son Kitai (Jaden Smith) is distant from his father, failing the rite-of-passage to becoming a ranger and disappointing them both. Kitai is fearful, unfocused, seeking his father's approval but lying to him to get it. He's also at the age when he's not quite a boy, not yet a man, and needs a father figure more than ever. But Cypher, ever the commander, has just returned from a long voyage, and only on his wife's request does he take his son on what he hopes to be his final mission – transporting one of the fear-honing beasts to another system. On the journey, the ship falls into an asteroid field and is forced into a crash-landing on Earth, killing everyone aboard except Cypher and Kitai. With Cypher's legs broken and the other end of their ship 100 kilometers away (that's approximately 63 miles for the metric-averse), which itself contains a beacon needed to re-establish contact with the outside world, Kitai must traverse great distances, face deadly, bloodthirsty animals, and retrieve the beacon to signal help before Earth and its creatures prove their undoing. "After Earth" is spiritually resonant, not just through Kitai's hero's journey, but Shyamalan's beautiful visual style. Establishing shots of a nature-covered Earth echoes the equally mystifying visuals of 2009's "Avatar," yet the setting bears as much beauty as it does danger for Kitai – poisonous creatures and sub-zero temperatures turn the young boy's suit a ghostly white, a sign of his life slowly draining from him. It's this unique bio-design for the suit and tech that makes the film stand out. Amidst fighting a range of monkeys, tigers, and other animals (brought to life with some admittedly dodgy CGI), Kitai slowly grows frustrated with his father's distrust of him, and when he lets his emotions get the better of him, his father instructs him to "take a knee" and recall his training. "Fear is a choice," says Cypher to his son. "But make no mistake, danger is real." Indeed, there is a sense of real, palpable danger in Katai's quest, somewhat reminiscent of the tension in Elizabeth's (Bryce Dallas Howard) journey in Shyamalan's 2004 film "The Village." "After Earth's" moments between father and son are subtle and poignant, hinting at the pain between them caused by some bad blood years prior. It's also the actors' real-life relationship that lends these scenes considerable gravitas. I especially enjoyed seeing Will Smith go beyond his usual Fresh Prince persona for the role, making for a stoic, controlled performance that, when he breaks the silence, you sit up and take notice of. Notice how director M. Night Shyamalan's name rarely appears in the marketing for "After Earth." His brand has left a foul taste in audiences' mouths, and not without good reason; I can still recall sitting in a packed theater when the onscreen trailer for 2010's "Devil" proudly proclaimed, "From the mind of M. Night Shyamalan," to a chorus of groans from the crowd. It's true: Shyamalan needed a film to remove the stigma left by several mediocre efforts, most with gimmicky twist endings that made the filmmaker a laughing stock. "After Earth" is his grand return to quality filmmaking; with the majority of the script wisely left to "Book of Eli" scribe Gary Whitta, Shyamalan fares far better as a director-for-hire. And those with apprehensions of another twist ending need not worry – "After Earth" has no such plot convections, keeping to a simple, straightforward narrative. It's Shyamalan looking to rebrand himself, and certainly the director's spirited, emotional auteurism work perfectly with the material. "After Earth" is a smart, solid, if unremarkable sci-fi thriller, and easily May's most satisfying blockbuster. The film is also further proof of its crew's surprising versatility, in Will and Jaden's range, as well as Shyamalan's renewed ability to captivate. It's not a film I'd ordinarily be passionate enough about to staunchly defend, but considering the widespread, deliberately misleading critical reviews out there, I'm strongly encouraging those inclined to give it a look for themselves. I'm sure they'll agree that, all things considered, all that's really lacking in "After Earth" is an alien punch. After Earth is rated PG-13. Ryan Maloney can be contacted at rMaloney@ErieReader.com, and you can check out more of his writing here.